As I looked back incredulously to see the bird saunter off the narrow road, I noticed the faces of the other passengers in the van. The majority were from Palawan, and they stared forward, unimpressed. They’d seen this show before. The drive from Puerto Princesa (on central Palawan) to El Nido (a town at the northern tip of the island) would take about 6 hours. I could have flown in directly from Manila, but flights were expensive and difficult to book**. The road offered some low-cost options, and the minivan was the fastest alternative. The van moved at an astonishing speed; I made a mental note to bring along a motion-sickness bag next time. Outside of the windows, life seemed to move at a slower pace. We passed groups of talkative school children who moved aside automatically at the sound of the familiar honking. Dogs without homes ambled by, wagging contentedly. The most captivating of the street-side blurs were the sturdy water buffalo, led by young residents of nearby villages. We drove by small clusters of stilt houses and vibrant, green rice fields. The highway wound around hills lined with palms and lush scrambles of unidentifiable plants. Occasionally, a glimpse of the ocean would tease us, the inviting blue a reminder that the cramped van was leading us to an extraordinary place. Soon, I would begin to explore El Nido and the majestic limestone cliffs that lay in the bay beyond, concealing turquoise lagoons and moon-shaped beaches. 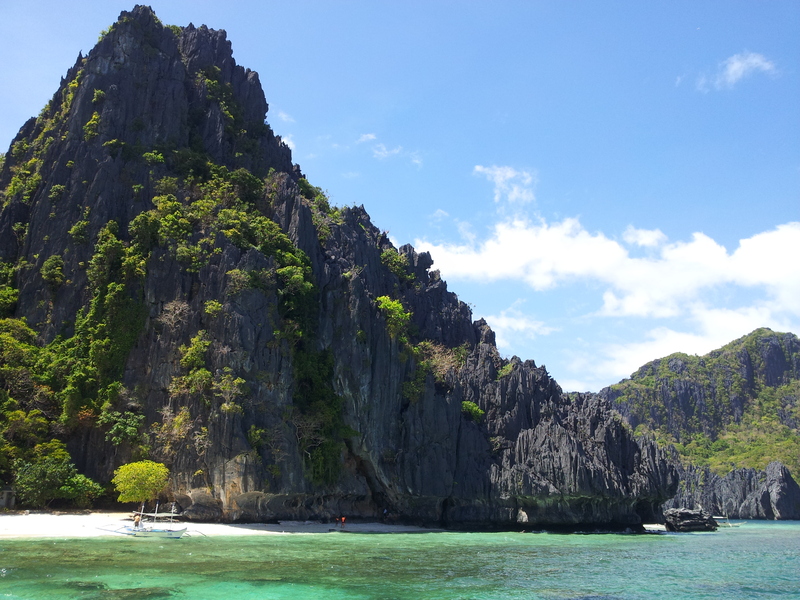 El Nido drew me in and tempted me to stay longer, but I returned to the road a week later. I chose to take the Cherry Bus back to Puerto Princesa. The coach was slightly cheaper than the minivan, but the trip was longer. I had access to Wi-Fi, and ample space to stretch my legs. The ride was decidedly more comfortable than the drive in had been, yet I felt oddly removed from the action on the road below. I was definitely too high up to see any chickens. * This post was my submission to a travel writing contest earlier this year. (I did not win :P) The assignment was to write a “mini guide” about a unique place or experience. The goal was to tell a compelling story while including tips so that others could replicate the experience. Quite the challenge, in 2500 characters! But I had a lot of fun writing it and wanted to share it here. ** From what I gather, you need to email the airline with the dates you’d like to fly and wait for them to get back to you. El Nido Boutique and Art Café can apparently provide this service for you (though it looks like you still need to send them your info and wait for them to get back to you, and it involves using Paypal or a bank transfer), so that might make the process a little easier.